Happy Leap Day and thank you Pinterest! I saw this great idea on Pinterest last week. It was very timely as just as few days ago my daughter came down with Strep throat and we’re on the whole twice a day schedule. This little trick has saved me from an under-dosed and over-dosed kid. Gotta love the whole collective sharing of the minds going on! Now if only I could get the walls of my house to look as pretty as some of the other things I’ve seen online at Pinterest.com, that would be a beautiful thing! Oh fair willpower, why hast thou forsaken me? The crunchy, spicy craving got me today. I caved and bought a bag of my favorite chips. Jalapeno flavored of course. Maybe tomorrow will be a better day. There's dog food in my lunch box! Yes, it's true. 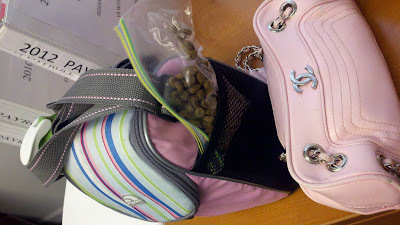 I do have dog food in my lunch box! Now mind you this isn't some crazy new diet. I just happened to luck into the coolest job situation ever. I can work from home half the time. The other half I work from the office and I get to bring my adorable dog Ladybug. So when I pack my lunch I have to pack something for the little princess. Gotta love it!